1. Preheat your over to 180C. Cover beetroot in tin foil and roast for about 60-75 minutes until cooked through. Set aside to cool, then refrigerate. 2. Place cashews, pumpkin seeds and sunflower seeds on a baking tray and toast for 10 minutes at 150C. Set aside. 3. Peel carrots, then thinly julienne using a zig zag peeler or on a chopping board using a shard knife. 4. Peel chilled beetroot, then slice into thin discs, place the discs flat on your chopping board and cut into match sticks. 5. Place julienned carrots, beetroot, baby spinach and raisins in a salad bowl. 6. Whisk together all the ingredients for dressing. 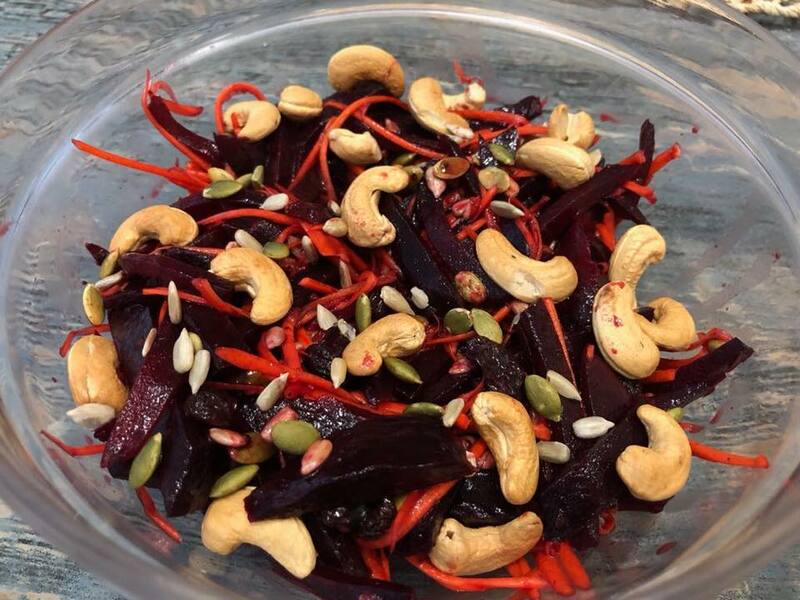 Pour dressing over salad and toss, garnish with toasted nuts and seeds. Serve immediately.